Kerry Bolton is a controversial writer from New Zealand, situated on the far right end of the political spectrum. He supports the Axis in World War II, but also believes that the Soviet Union (especially under Stalin) played a positive role in world politics. Bolton extends support to Saddam's Iraq, Milosevic's Serbia, Gaddafi's Libya and (more surprisingly) Venezuela under Hugo Chávez. The enemy is “demoliberalism”, globalism and the Jews. I've previously reviewed Bolton's book “Stalin: The Enduring Legacy”. “Perón and Perónism” is Bolton's take on General Juan Perón, President of Argentina 1946-55 and 1973-74. While Perón is arguably the most important character in Argentina's post-war history, he has been almost eclipsed in popular memory and culture by his second wife, Eva Duarte or Eva Perón. Indeed, there are probably more books about “Evita” than about her husband! The organization founded by Perón as a vehicle for his politics, Partido Justicialista, is still one of the largest political parties in Argentina. 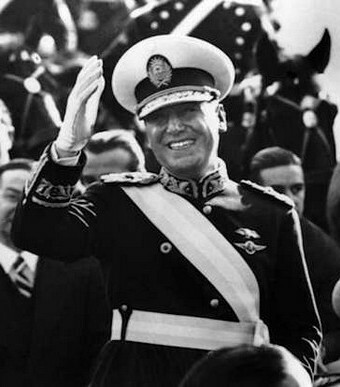 While Perón's governments could be described as left-populist, his legacy also contains far more problematic aspects. His attempts to counter British and American influence in Argentina made him sympathetic to the Axis. Many notorious Axis war criminals sought and got refuge in Perón's Argentina, including Josef Mengele, Adolf Eichmann and Ustashe leader Ante Pavelic. When Perón was deposed by a military coup in 1955, he fled to Spain, at the time still under control of right-wing dictator Francisco Franco. Unsurprisingly, it's the combination of left-populism and pro-fascism which makes Perón and Peronism of interest to Bolton. I think he sees Perón as, at bottom, a fascist (in the “classical” sense of that term). I haven't double-checked Bolton's analysis of General Perón's political philosophy, but if the author is right, then Perón could indeed be described as fascist or fascist-inspired, at least as far as his personal convictions go. There are also similarities between Perón's ideas and those of Catholic social teaching. But then, the papacy was sympathetic to Mussolini's corporatism. Argentina as a state never became fascist under Perón's leadership, instead developing traits more similar to West European Social Democracy with strong labor unions, a mixed economy and a welfare state. Perónista Argentina also remained a parliamentary democracy. Still, Perón's private ideology or strategic goals might have been different from his more pragmatic practice. I admit that I found the author's arguments interesting! According to Bolton, Perón rejected the French revolution and the Enlightenment. Behind the rhetoric about liberty and equality, the revolution had ushered in capitalism and the concomitant rule of the materialist-minded bourgeoisie which “insectified” humans and tore apart the community. Perón harked back to the Middle Ages, when society was organic and based on guilds of professional artisans. His goal was to recreate such a society through corporatism and national syndicalism, abolishing class struggle and political parties in favor of national unity. Perón and/or his associates attacked usury, the IMF, Masonry and Anglo-American imperialism, but also Marxism and the Soviet bloc. Despite his seemingly ultra-conservative stances, Perón in practice promoted the rapid industrialization and modernization of Argentina through the medium of a strong state and powerful unions. The author is a conspiracy theorist, and believes that Perón recognized the conspiracy (the "synarchy"). To Bolton, liberal capitalism and Communism are equally globalist and involved in a vast conspiracy against nationalism everywhere. It's a fact that the Argentine Communist Party opposed the Peronists, sometimes in alliance with liberal groups (probably due to Perón's pro-Axis orientation). To Bolton, this proves the point. The author further believes that the Montoneros, a left-Peronist urban guerilla group during the 1970's, were really provocateurs who wanted to split the Peronist movement on behalf of the plutocracy. He levels similar charges against the ERP, a rural guerilla during the same period, which was originally Trotskyist. In Bolton's mind, “Trotskyites” are, of course, Jew-controlled. While Bolton opposes the notoriously repressive right-wing military regime which held power in Argentina 1976-1983, due to its neo-liberal economic policies ordered by Washington, he nevertheless accuses the leftist revolutionaries of having provoked the coup through their terrorism. Despite his anti-Communism, Bolton has a soft spot for Cuba, and even quotes Perón's eulogy for Che Guevara. He also believes that Argentina was right to establish diplomatic relations with the Soviet Union, and calls Venezuela's Hugo Chávez “a Peronist”. As already noted, Bolton views the Soviet bloc (post-Lenin) as a counterweight to world plutocracy. I think he sees Cuba, but particularly Venezuela, as at bottom nationalist rather than Communist. This “Red-Brown Bloc” perspective might make Bolton controversial among more traditional right-wingers, but it's a common line in many East European nations as we speak.